Ica city is the capital of department and province of same name. The department of Ica has 4 provinces, Ica, Pisco, Nazca, Chincha and Palpa. Ica city is located in the central coast, 406 meters above sea level (1,332 feet), 202 miles (325 Km) south of Lima, 47 miles (75 Km) from Paracas and 84 miles (135 Km) from Nazca. Ica city was founded in 1536 by the Spaniard Jerónimo de Cabrera. He gave the name of "Villa de Valverde". The city was in the middle of a fertile valley. Before its foundation, the Spaniards planted grapes brought from Canary Islands (Spain) and then began the tradition of the wine and the pisco. Ica was the first city in "Nueva Castilla" (Peru in the Viceroyalty times) where wine and grape liquor were produced, and from this point they were exported to all the Spanish colonies in America. 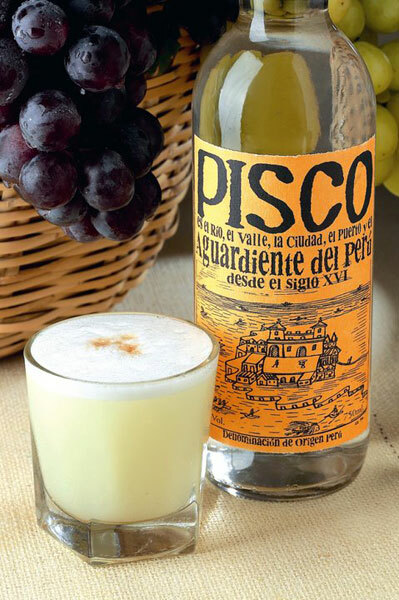 They used the port of Pisco to embark the grape liquor, giving origin to the name of one of the most famous liquors prepared in Peru, pisco. 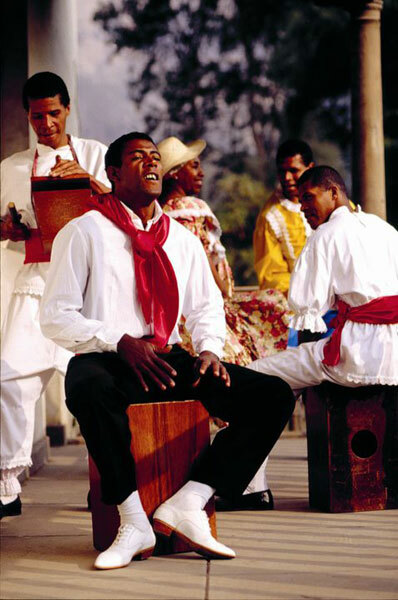 The Afro-Peruvian folklore is an essential contribution from Ica, and it is expressed in its lilting rhythms, the cheerfulness of its people and its gastronomy. Ica boasts characteristic dunes and a vast desert etched with enigmatic figures, the Nazca Lines, transformed into fertile fields by ancient cultures: The Paracas and the Nazca. Land of valleys, sun, beaches and a Natural Reserve inhabited by a lush variety of flora and fauna, it is also a mysterious land of villages, home of fine wine and "pisco", Afro-Peruvian music, and an oasis like the Huacachina, a patch of life in the heart of a blanket of sand. Initially part of the Society of Jesus group of monuments. The original construction dates to the 18th century, but it was renovated in 1814. Its exterior is neoclassical in style, while the predominant style in the interior is Baroque, especially the pulpit and altars. Located in front of the Plaza de Armas (main square). Temple in the neoclassical style, currently ruined by the 2007 earthquake. The Lord of Luren is considered the patron saint of the city. In Easter Week and during the third week of October, thousands of worshippers meet to accompany the image of the patron saint in a procession. Location : Ayacucho street block 10, the figure is temporarily placed at the front of the temple. It has a collection of items from the Paracas, Nasca, Huari, Ica and Inca civilizations on display. It also holds colonial artworks and furniture, and some Republic-era items. Visiting Hours: Mon - Fri 8:00 am - 7:00 pm / Sun and public holidays 8:30 am - 6:30 pm. Location: Ave. Ayabaca block 8 Urb. San Isidro. One of the few remnants of Vice-Royalty-era architecture that have survived the earthquakes in the region and urban growth. The beautiful rococo-style gateway, carved from stone, is not to be missed. Also known as Casa Bolívar (Bolívar House), as Simón Bolívar stayed there during his journey through the city. Location: Libertad street block 1, Plaza de Armas (main square). Ica is very famous because of its pisco (grape liquor) and wine; a good alternative for your trip could be a visit to the pisco cellars and bodegas (wineries) of La Caravedo, Vista Alegre, Tacama, Ocucaje and the artisan ones located in the suburb of Guadalupe. In these places you will be able to learn about the elaboration of pisco and the wine in the traditional way using distillers made during the Colonial time. Tacama Vineyard: 7 Km (4 miles) northeast of Ica (45 minutes). Visiting hours: Mon. – Sun. 9:00 A.M. – 5:00 P.M. It is dedicated to the elaboration of wine and pisco. It was owned by the Jesuits during Colonial times, and the mansion and the old stables of the epoch still remain. Bodega Vista Alegre: 3 Km (2 miles) northeast of Ica (10 minutes). Visiting hours: Mon. – Fri. 9:00 A.M. – 4:00 P.M., Sat. – Sun. 9:00 A.M. – 5:00 P.M. A traditional bodega dedicated to the elaboration of wine and pisco, it still maintains characteristics of Colonial practices of grape processing. Bodega Ocucaje: Avenida Principal. 34 Km (21 miles) southwest of Ica (45 minutes). Visiting hours: Mon. – Fri. 9:00 A.M. – 12:00 P.M. and 2:00 P.M. – 5:00 P.M. Sat. 9:00 A.M. – 12:00 P.M. 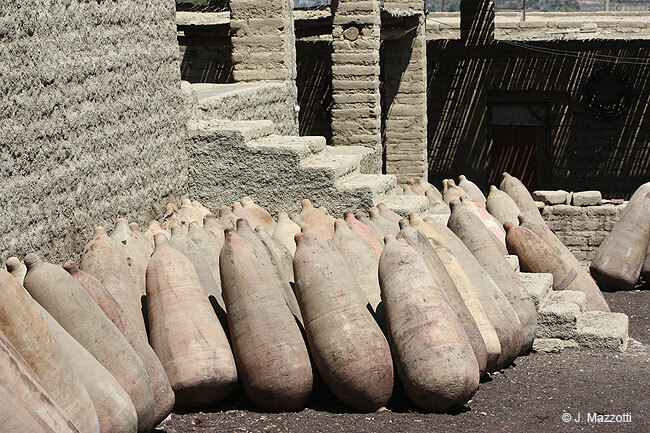 The bodega demonstrates long used traditional techniques of the department for the production of pisco and wine. This festival in March, is a celebration of the abundance of grapes and wine in the region of Ica, where persevering efforts in local vineyards have spread greenery across vast tracts of once bone-dry desert. The Wine Festival involves fairs, competitions, processions of floats, musical festivals and parties where guests dance the Afro-Peruvian festejo. One of the major attractions of the event is the Queen of the Wine Festival beauty pageant. Accompanied by her hand-maidens, the beauty queen treads grapes in a vat in the time-honored tradition to extract the juice that will eventually be fermented. Apart from the delicious local sweets known as tejas, made from pecans or candied fruits, filled with caramel and covered with sugar icing, those attending the event can free flowing wine and pisco the aromatic and tasty grape brandy that originated in this part of southern Peru four centuries ago. The best way to appreciate the lines is to get a bird's-eye view from overflight. From the airfield of Ica you can take an overflight tour to Nazca Lines and Palpa Lines. There are several companies that offer the flights over the Nazca lines, some start their flights from the airfield of Nazca, Paracas (Pisco) or Ica. Normally the flight from Ica lasts 1h. 30 minutes and 1h 45 minutes if includes the Palpa Lines. The small aircrafts are specially designed with large panoramic windows and good comfort to take great pictures and audio-guide. It is advisable to have an advance reservation, which you can reach at Nazca and no place to get the flight, specially in high season. Passengers must pay an airport tax in addition to the value of the overflight tour. Traditional relaxation spot for Ica residents. 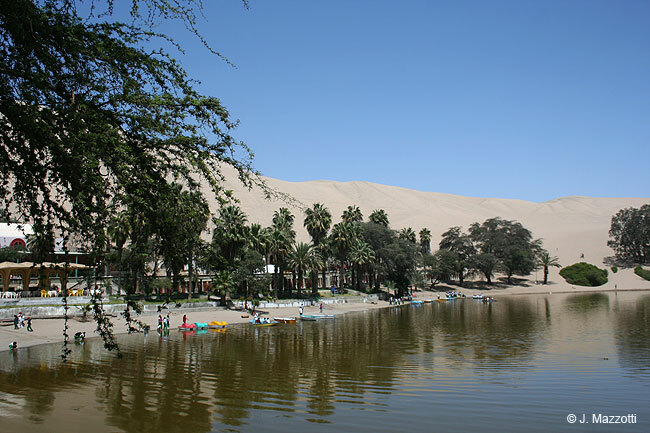 An oasis in the middle of the desert, with a splendid landscape of palm trees, "huarangos" (acacias) and dunes, where you can go sandboarding. Its waters are said to have curative properties. Location : 5 Km south-west of Ica (10 minutes). 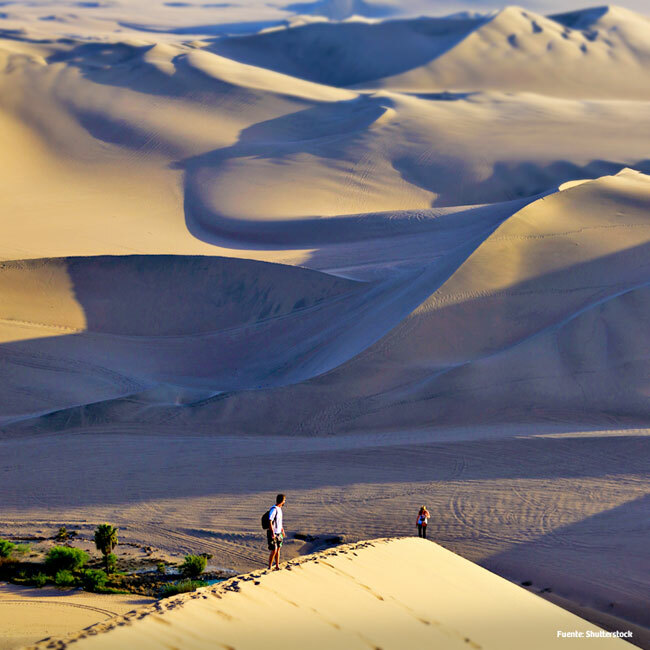 One of Peru’s prettiest and most impressive deserts lies in Ica, a region of rare beauty that welcomes visitors with its delightful coast, which includes places perfect for adventures sports such as sandboarding and riveting dune buggy excursions. 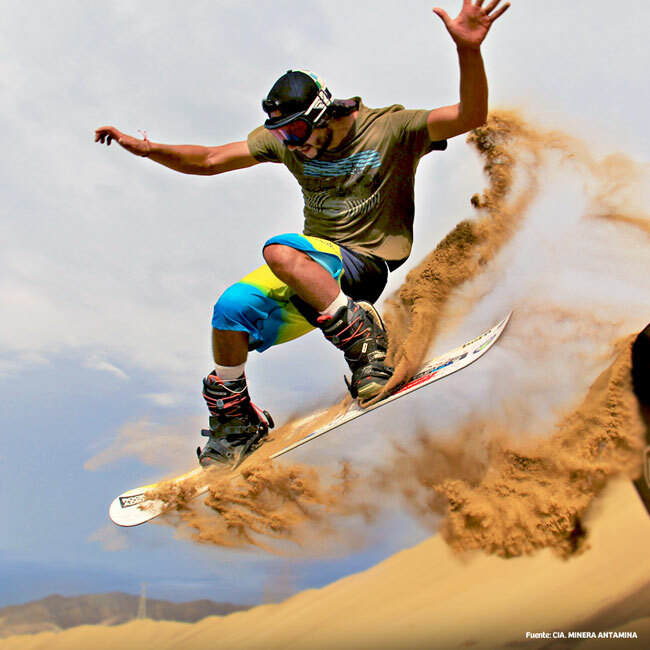 Sandboarding first took hold in Peru on the dunes of Huacachina before spreading across the whole country. There are different techniques for sliding down the dunes, such as “slalom” (zig-zagging between gates), “boarder cross” (an obstacle competition between two or more participants), “slope style” (tricks on rails and ramps) and “big air” (huge jumps off a ramp). Protective equipment for sandboarding includes a helmet, elbow pads, knee pads and special glasses for the sand. The sandboard has bindings for riders’ feet, giving him or her a firm stance on the board. We recommend wearing comfortable clothing and following the experts’ advice. Dune buggies have become an unmissable attraction for travelers, who experience the excitement and speed of these famous sand vehicles zipping up and down over the strangely shaped dunes and the beautiful landscape sculpted by the wind at Huacachina. To take part in this exciting buggy excursion, it is advisable to wear light clothing appropriate for the suffocating heat in the mornings (especially in the summer months of December through March) and to take a jacket for the afternoon breezes. We also recommend bringing water, a hat and sunscreen to fully enjoy the experience.